Navratri 2013 is just around the corner. And with this, the whole world will again witness thousands of Hindus worldwide come together to celebrate the Navratri festival, which pays worship to the Divine Mother in Hindu religion, the female counterpart of the paternal Creator of the Universe. The Hindu religion may be one of those that gives due importance to female deities that are crucially venerated in mythology and culture. The sacred femininity is held at a high pedestal in Hindu religion. Of course, the Navratri festival may not be as popular to the rest of the world as Ramadan is. Some may not even be familiar with the concept of goddess worship in Hindu religion, which is stereotyped to be male-dominated. But this may serve as an eye-opener to the pessimistic critic, especially for this Navratri 2013. 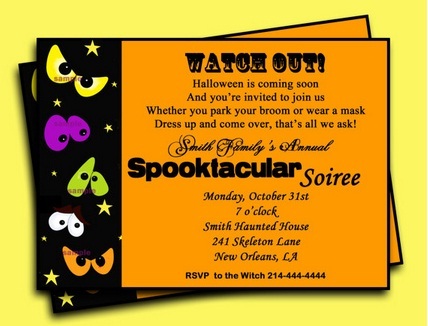 While the rest of the commercialized popular world awaits the latest Halloween costume ideas for 2013, Hindus prepare for a worship that re-defines the concept of sacred femininity and the place of women in the culture of worship. Hinduism celebrates the Navratri as worship to the Divine Mother, Durga, who is believed to be the mother of all. It may be the only religion in the world that gives due praise to an equal counterpart of the Creator that is depicted as in the paternal sense. Literally, Navratri means “nine nights.” The origin of the “nine nights” celebration roots from a long way since the belief in ancient times. The Navratri is celebrated twice a year to mark the beginning of summer and the beginning of winter. In Hindu beliefs, these times of the year are very symbolic for worship because the changes in the season are divine providence to achieve in the earth’s balance. The changes of the season cause people to think and act; thus, worship becomes necessary to achieve the similar physical and mental balance. The worship lasts for nine nights and nine days in order to celebrate the three goddesses in Hindu religion: Durga, Lakshmi and Saraswati. The different levels of worship to these goddesses bestow different blessings in a Hindu’s life. Durga, for instance, is believed to bestow wealth, prosperity and knowledge. For 2013, Navrati will start on October 9 until October 13. The celebration of the festivals may last for one day or more. Pratipada refers to the first day of the fortnight of the Hindu calendar in the month of Ashwin. 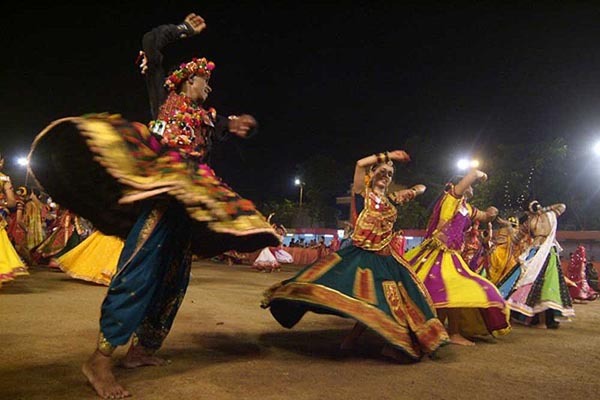 The legend behind the Navratri celebration stretches a long way back in ancient times in India. It was believed that Mahishasura, a follower of Shiva, acquired a power to gain immortality. With this, he started to take innocent lives away. Brahma, Vishnu and Mahesh used their divine powers to stop him. By doing so, they created Durga, a powerful warrior goddess. Durga and Mahishasura engaged in a war that lasted for nine days until Durga was able to defeat the latter by beheading him. This is the reason why Navratri is celebrated for nine days. Another legend in Hindu mythology that gave birth to the nine-day celebration of the Navratri originated from the marriage of Uma at Shiva. It was believed that Uma, daughter to King Daksha of the Himalayas, married Shiva against her father’s will. The story goes that Daksha offended Shiva when Uma visited home for the yagna. Uma jumped to the agnikund, unable to hear her father’s insults. She was then reborn as Sati and still married Shiva. She made peace with her parents and stayed with them for nine days. Later on, this was celebrated as Navratri. In the historical sense, Kshatriyas avoided engaging in activities that related to war during the monsoon season. When the monsoon season would have been over, they will worship Devi for nine days before resuming with war-related activities. 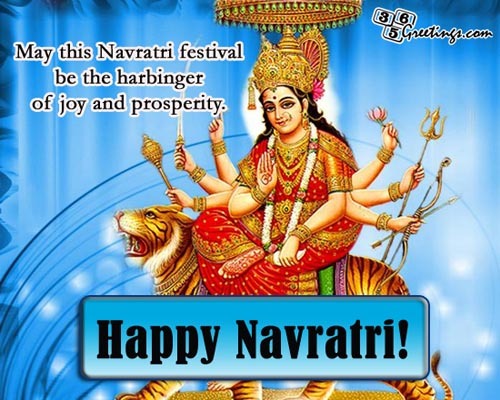 The nine days are also celebrated today as Navratri. The celebration commemorates the legend of the warrior goddess Durga, who is also known for the names Devi and Shakti. It is believed that Hindus acquire an energy that removes miseries in life for worshipping Durga. This is also the time in the lunar year that pays great respect to the universal mother and the divine femininity in Hindu worship. The Creator in Hindu worship is believed to be the one that has put stability in the world. The Divine Mother is one that continually puts balance into the world’s energy in order to maintain its life system. Navratri is an affirmation that change is inevitable; thus, balance is necessary to maintain physical and mental stability. 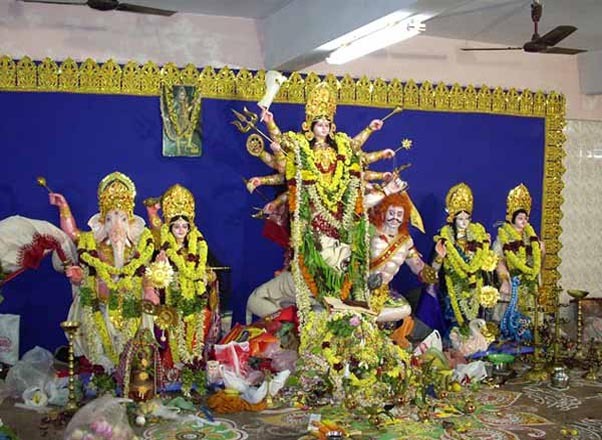 Navratri is celebrated by going to Dakshineswar Kali Temple in Kolkota, West Bengal. The climatic celebration is through a grand procession on the tenth day of the worship. There are also worship songs and dances during the nine day celebration. The most important days of the worship are the last four days because this is when kanyas or pre-pubescent girls are taken out and worshipped to celebrate the warrior goddess Durga. On the ninth day, Ayudha Puja is celebrated. This is where people take out their tools, study books and everything else related to livelihood and place these at the altar of Durga to be blessed with prosperity and success. Saraswati Puja is performed on the tenth day in order to invoke blessings of knowledge and mental peace. The Navratri is celebrated as a community event wherein Dandiya Raas and Garba Raas, worship songs and dances, are conducted. The Jaagran is also done as an additional praise to Durga. Devotees venture to the Amba Mata Temple at Junagarh Gujarat during the nine days worship as well. Women also perform Garba dances in the temple, wherein there are painted earthen pots that are danced around to. The men also perform a Garba that is related to agricultural rites. Fasting is observed for nine days. This is the Navratri fasting that is guided with specific food ideals to be eaten for the celebration. NOTE: Navratri fasting depends on the physical and mental capability of a devotee, but for the strict implementer, fruits and water are only consumed for nine days. Flour and grains are avoided. In the modern celebration of Navratri, some people eat vegetarian non-grain based foods in order to keep their strength for the rest of the celebration. • The temple of the goddess Kheer Bhawani is visited during the nine-day celebration. • Aarti is done after the fasting on the ninth day. Chamundi is worshiped for the Navratri in Mysore. The worship of Chamundi on the tenth day is spent on grandeur with a grand procession of elephants, horses and chariots. Even the people are adorned with magnificent clothing. In Tamil Nadu, Karnataka and Andhara Pradesh, the Bommai Kolu is performed by women. Nine kanyas or virgins are given flowers and sweets, while married women share flowers and spend time eating together. Garba is one of the much awaited dance performed during auspiricous occasions like Holi and Navratri. Navratri garbe dance symbolizes worship of the Goddess Jagdamba. Traditionall, Navratri Garba is performed by women, but these days, men may also participate in the performance. This kind of dance is performed in a circular formation. Performers clad themselves with elegant and colorful attires. So what is Garba? 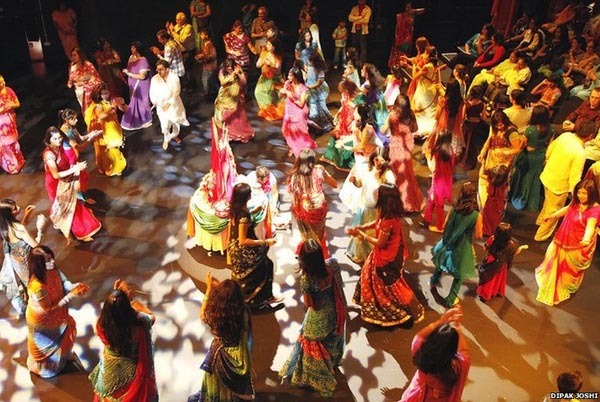 The meaning of Garba is derived from the root words “Garbha Deep”. In Hindu religion, Deep is known as a lamp that is placed inside an earthen pot or also called as Garba. The lamp gives out light through the Garba which symbolizes embryonic life. Kulhad ki Kheer: served in earthen bowls to match the essence of the occasion, this is also served with Samai rice with dry fruit kheer. Stuffed Tomatoes: not only is this recipe delicious, it is also healthy. Phalahari Kadhai Paneer: cubed cottage cheese in tomato gravy. Raw Banana Koftas: drenched in potato gravy, the raw banana is moulded to dumplings. 1. Take a bath in the morning. 3. Put water in the Kalash with the mango leaves and coconut. 4. Tie the Moli on the neck of the Kalash. 6. 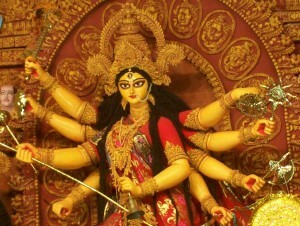 Put the image of Durga in the room. 7. Worship with Roli, rice, flowers, Balepatra, Kumkum and Gulal. 8. Add burning coal to the clay pot. 9. Pour a Ghee or clarified butter in addition to the burning coal. 10. Put a small amount of sweetmeat to the fire while continually adding the ghee. 11. After the Puja, fold your hands and encircle the flame three times. 12. Then, light the incense and the deep. 13. Perform the Aarti, wherein a devotional song can be performed. 14. Chant the Durga Saptshati or Devi Kavach.